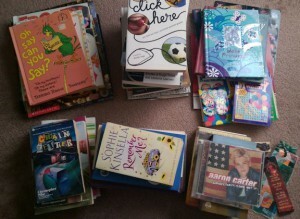 This week’s task was cleaning up the bookcase in the room that was the kids’ study. Rather than just calling it the kids’ study, I’ve decided to use a past-tense description because that helps me to imagine the beautiful sitting room I’ve been visualizing is already here in the present. Some of the books are definitely worth keeping, such as a hardcover set of Harry Potter and the delightful Inkheart series by Cornelia Funke. But others, well, not so much. All those paperback teenage novels my daughter read 10 years ago will soon find a new home at the thrift store. And although reading the tongue-twisters in Dr. Seuss’ “Oh Say Can You Say?” was great fun when my kids were little, it should have been given away with the other picture books long ago. Oh say can you say—there were books piled on books, in deep dark dusty nooks, random heaps stacked up all over like a lawn with weeds and clover, getting ever fatter till they made a clutter splatter! Cleaning up the bookcase made the fatter clutter splatter better. Hi Meg! I like your poem 🙂 Good for you getting rid of the books! I can’t wait to see pictures of your new sitting room! We have one bookcase in our house, and have a rule that if we ever have more books than what fits in that one case, it’s time for something to go. We pretty much get books on e-reader now so it isn’t really a problem, but I like the idea that we have a finite amount of books in the house (no kids yet – so I am sure that rule will flex as time goes on :)).